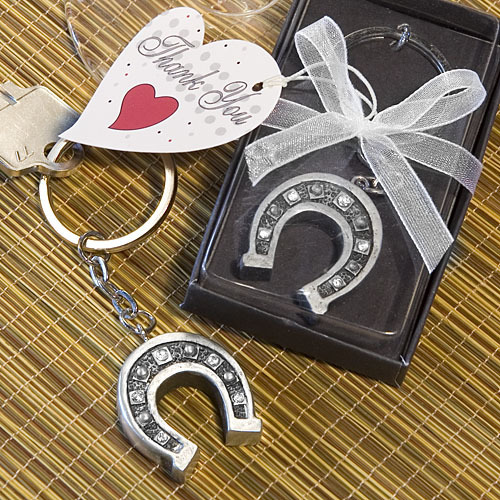 For such an inexpensive party favor, these lucky horseshoe key chains sure are splashy! The perfect 'thank you' for a western themed party or wedding and 'good luck' party theme! Each key chain favor measures 3.5" x 0.25" x 1" with a metal key ring and chain attached to a resin pewter colored horseshoe charm lined with alternating rhinestones embedded at its center. Sold only by Fashioncraft, each comes packaged in a deluxe clear topped box with a black base, tied with a white ribbon and attached thank you tag. Please allow up to 5 business days to process your order; add ship time from NY.